Class-tested and student-approved, Gray, Salter, and Radebaugh's new text has been praised by reviewers for its clear, concise, and engaging writing style. Throughout, the authors take a user perspective approach, emphasizing what managers need to know as they approach the global business environment. The text's succinct, current, and highly relevant content makes it perfectly suitable for a one-semester MBA or Masters of Accounting course, a final year undergraduate International Accounting course, or as a supplemental text in a MBA Management Accounting or Management Control course. Sidney J. Gray, Ph.D., is Professor of International Business and Head of the School of International Business in the Faculty of Commerce and Economics at the University of New South Wales. He is also foundation Co-Director of the Australian Centre for International Business(a collaborative venture with the University of Melbourne). Professor gray has published in many leading journals around the world, and is the author/co-author of a number of books, including International Accounting and Multinational Enterprises and Financial Accounting: A Global Approach. In 1994 he as named "Outstanding International Accounting Educator" by the American Accounting Association. Stephen B. Salter, Ph.D., is an Associate Professor in Accounting and Executive Director of the University of Cincinnati, College of Business Center for Global Competitiveness. He has a Ph.D. in International Business and Accounting from the University of South Carolina. Dr. Salter has published more than 20 articles in a variety of global journals, including the Journal of International Business Studies and the International Journal of Accounting. Dr. Salter's recent research has focused on examining the validity of American-based cultural and control paradigms in a non-US environment. Lee Radebaugh, Ph.D., is the Director of the School of Accountancy and Information Systems and KPMG Professor of Accounting at Brigham Young University. In addition, he is the Executive Director of the BYU Center for International Business Education and Research (CIBER). Professor Radebaugh is co-author of International Business Environments and Operations and International Accounting and Multinational Enterprises, and is the co-author of seven books on Canada-U.S. trade and investment relations. In 1998 he was named the "Outstanding International Educator" of the International Section of the American Accounting Association, and "International Person of the Year" by the World Trade Association of Utah. 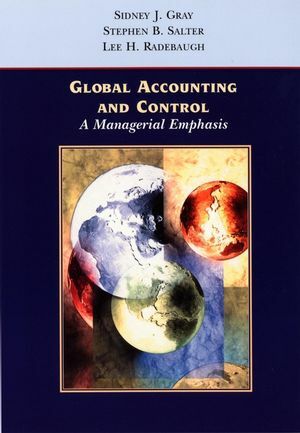 Global Business: Accounting and Control Issues. Foreign Currencies and Exchange Risk Management. Global Organization, Coordination, and Control. Planning and Performance Evaluation in Multinational Enterprises. Taxation and the Multinational Enterprise. Foreign Currency Accounting and Exchange Rate Changes. Auditing and the Multinational Enterprise. The authors have substantial reputations as international accounting researchers and many years of experience teaching international accounting. "International Bulletins" provide current and relevant side bars to enliven discussion and enhance learning. Web site references (hot links) throughout the book allow students to go online and further explore topics. These links will be updated on the instructor's Web site. A full set of Power Point slides keyed to the book will be available on the book's Web site.